Also, as stated on their website, Boomerang is Open Source under a BSD license. So, acquiring this valuable data through Boomerang has essentially no cost. However, Boomerang doesn&apos;t include much in the areas of visualization. There is a small plugin that displays raw numbers and a status bar at the bottom of each page, but deep analytics and visualization of all of its data has been hard to come by. Boomerang provides some really amazing data that is, in a way, the &apos;last mile&apos; of measuring website performance. Because data is sent over the wire, it is easy for ExtraHop to provide the missing piece. By combining Boomerang and ExtraHop, you can access data and visualizations that were previously only available from other expensive software. Perceived Load Times by browser/platform The Real User Monitoring dashboard is broken down into five regions: Critical Indicators, Round Trip Timing, Browser/Platform Performance, W3C Navigation Timing, and Page Views. The Critical Indicators and Round Trip Timing regions display arguably the most important Boomerang-measured timing value: Perceived Load Time. 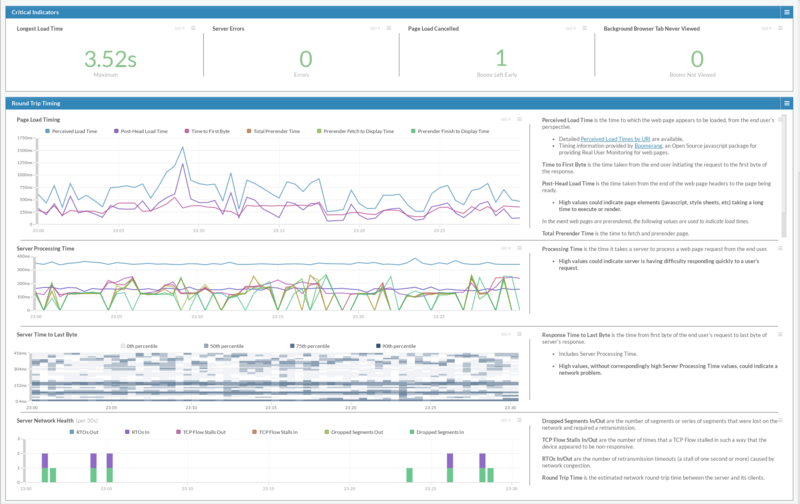 The Server and Network health metrics help you quickly determine if your servers or networks are causing slow page loads, and whether users are cancelling web page loads (likely because of slow performance). The Browser/Platform Performance region breaks down the Perceived Load Time metric by browser and platform to give you insight into whether certain browsers or platforms are having more difficulty loading your pages. The W3C Navigation Timing region shows sub-page timing information. This information can help a developer narrow down specific page rendering problems and identify whether those issues are network- or client-related. Lastly, the Page Views region shows you business-related metrics: most requested web pages, web page status codes, and bandwidth used by the overhead of your web pages. Note: Your data feed (such as through an ERSPAN, RSPAN, RPCAP, or port mirror) must be configured and able to view traffic for your internet-facing web tier. Assign the trigger to the device that is receiving the Boomerang results beacon, whether that is your web tier or a load balancer in front of the web tier. Deploy Boomerang on your infrastructure by following the instructions on our forum. Change the value of that variable to the path of your Boomerang beacon page on your web tier or load balancer. The Boomerang beacon can be just about anything (such as an empty HTML document or, an image), as documented here.